Funerals for public figures can often be stuffy affairs with formal speechmaking and half-hearted appeals to emotion, but the recent ceremonies for B.C.’s former premier were rife with real affection. The official state memorial in Victoria came first, followed the next day by what was more a gathering of the clans at Vancouver’s Croatian Cultural Centre, not that far from where Dave Barrett grew up on the city’s rough-and-tumble east side. Both events were packed, befitting the immeasurable contribution he made to the province of British Columbia during his short 39 months as its first socialist premier. (Unlike today’s New Democrats, he never shied from using the term “socialist.”) Beyond his political legacy, there was an outpouring of real affection for someone who had such a long career, was generous with his time and compassion and never ceased battling for folks on the bottom rung of life’s ladder. I was glad that some recalled and rued Barrett’s defeat in his bid for federal leadership of the NDP in 1989. He lost on the fourth ballot to well-meaning but lack-lustre Audrey McLaughlin, in large measure because of a belief by eastern party members that the NDP had to elect a leader who spoke French in order to have any chance in Quebec. McLaughlin was bilingual. Barrett’s warning about the pending threat of western alienation was ignored. Under McLaughlin, the NDP was virtually wiped off the face of the map in the next election, a shellacking that almost certainly would not have happened with Barrett at the helm, one of the best campaigners the NDP ever had. 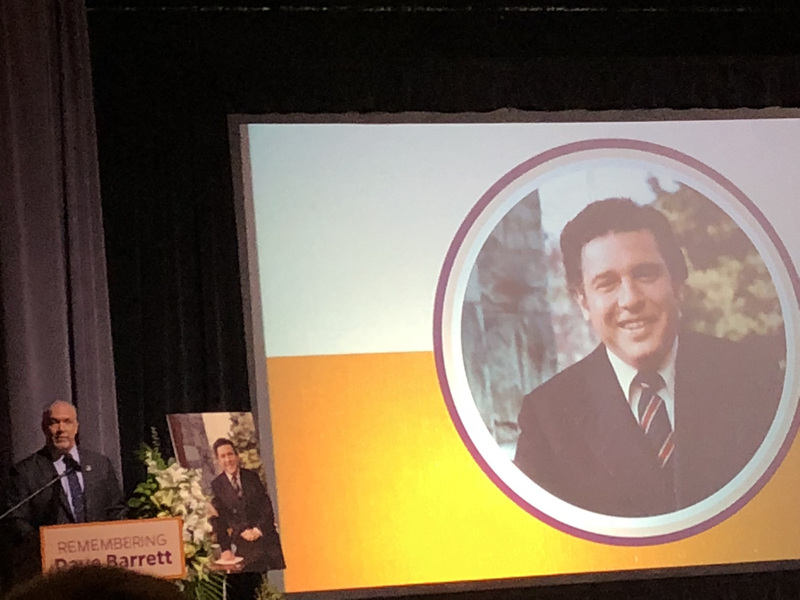 (Barrett’s heads-up over western alienation turned out to be prescient, since the rise of the Reform Party was a major factor in the NDP’s poor showing, while the party went nowhere in Quebec.) Horgan was one of those expressing regret at the party’s leadership choice. “Just think what would have happened if Dave Barrett had become leader of the federal party,” he exclaimed. 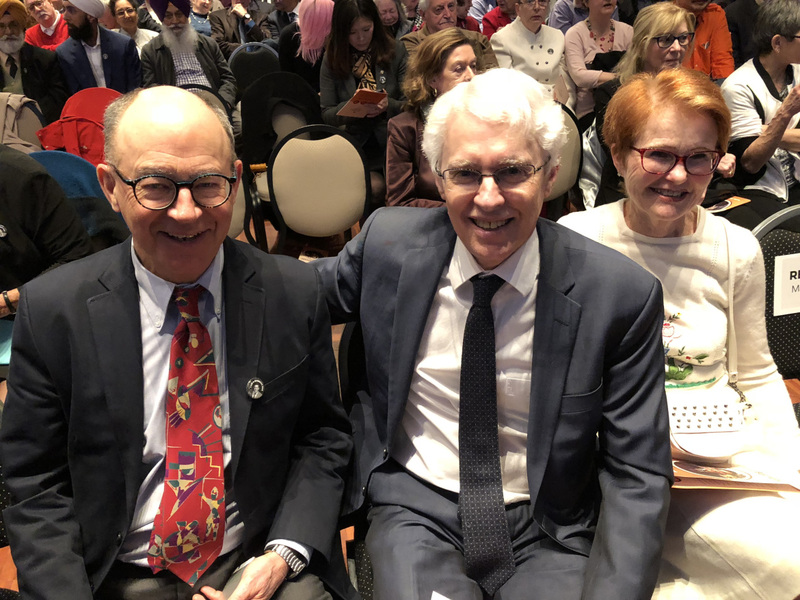 Added Joy MacPhail, who was in the forefront of Barrett’s bid: “…the way he would have stormed the federal stage…I think to this day that he would have made the best leader.” The Ottawa press corps would have lapped up his humour and no-holds-barred, colourful presence. Speakers in the house included Gerry Scott, Andrew Petter and Joy McPhail. 3 Replies to "Bidding Adieu to Dave Barrett"
How the heck can I Share Katherine’s post about Dave Barrett, with the small colour pic of him? Interesting and touching article. I enjoyed knowing about this premier and his personal side .